As a series, Alone in the Dark has a bit of a tainted history. 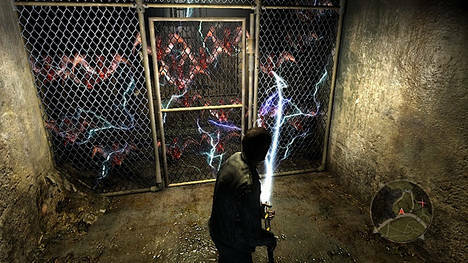 Its first title is credited with creating the feel of the Survival Horror genre and is a landmark game. From that lofty peak, however, what started it all has produced one mediocre sequel after another and has been consistently outshined by the likes of Resident Evil and Silent Hill. And let's not even talk about the Uwe Boll film adaptation. Eden Games aimed to change all of that this year by giving the old property more than just a new coat of paint. 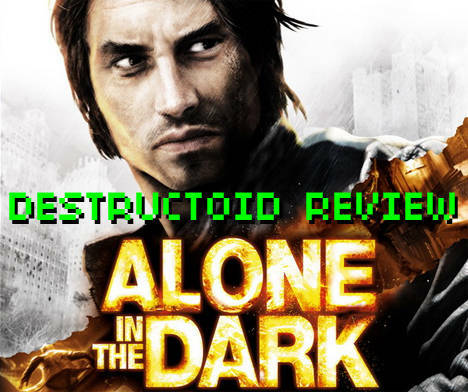 This Alone in the Dark is bold and ambitious, boasting features never before seen in gaming combined with a slick, current-gen appearance. Is this the revival that is going to put the franchise back on the map as the cutting edge of the genre it created? Hit the jump to find out. 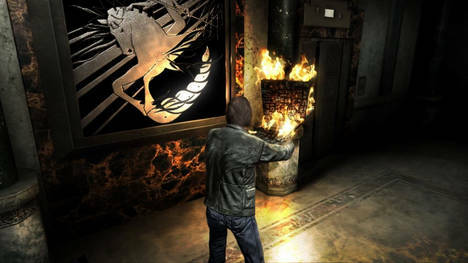 The game follows series protagonist Edward Carnby, who awakens with no memory in a modern Manhattan hotel room as a malevolent force threatens to tear apart the city. As the plot continues, it's discovered that something ancient and evil has been hiding under Central Park and Carnby is the only man equipped to stop its reign of terror. At least, I think that's what happened. The story is a muddled mess of prophecy and destiny culminating in an ending that will either enrage you or put little more than a smirk on your face, depending on how much of an artfag you are. If you're willing to even make it that far, that is. The pacing of this game is abysmal, surging foward at incredible speed only to come to a dead stop midway through as the game forces a collection quest on you that can span the whole of the considerably large overworld. Once completed, things pick back up again briefly before it inflicts the same collection quest again. It's an obvious ploy to stretch roughly eight hours of gameplay into twelve, and an infuriating ploy at that. No, Alone in the Dark is all about style over substance and, to its credit, it has that in spades. There's a concerted effort to give a cinematic feel, using a third-person camera that shifts from being over-the-shoulder to fixed angles at dramatic points. Camera control is practically non-existent, allowing the player little more than a few degrees of angle adjustment. While inconvenient, to say the least, it does have a certain immersive quality, like a third-person perspective shoehorned into first-person. There is a first-person view available, switched to automatically when aiming a firearm, and it has some intruiging characteristics. Pressing a button blinks Carnby's eyes and is necessary to clear his vision when injured or poisoned. As the game progresses, he gains a level of second sight when his eyes are closed, highlighting weak points on enemies or revealing hidden symbols in puzzle sequences. 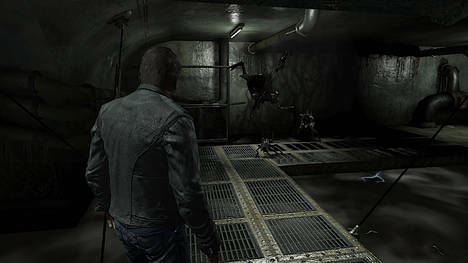 Since the right stick is unused for camera control, it is freed up for the manipulation of objects. When holding an environmental object, the direction the player holds the right stick determines how Carnby holds it. This object use is critical for solving some puzzles and doubles as a melee mechanic for the swinging of chairs, lead pipes and other assorted bludgeons. It's a good thing that the melee option exists because using the gun often feels like an exercise in futility. There is an auto-aim function, which works wonderfully for the smaller enemies. The teeming undead mass of humanity is a different story. The tiny fissures along their bodies are difficult to hit when they are standing still. In motion, they move like a high-school track star on a meth binge and successfully shooting them at that point becomes as much a matter of luck as skill. What's easily the most interesting aspect of Alone in the Dark is the manner in which it manages inventory. Carnby's coat has a series of pockets where he can stash an assortment of small items found in lockers, trash cans or just lying around. Once he has them, he turns into MacGuyer and can combine them into useful or lethal tools. A liqour bottle can become a powerful bomb by taping a box of bullets to it or a molotov with a handkerchief. Glowsticks can increase the area they illuminate by affixing tape and throwing them on to a surface. There are over twenty-five ways to combine items, some being utterly useless. The inventory system operates in real-time, so trying to put together a weapon while under attack can be challenging to do, especially since the sequence in which you select items to combine makes a difference (it shouldn't and that may annoy some). To help in this and to spare the player some annoyance in reproducing the same things repeatedly, you can set four configurations of items for quick creation. When you want something you've designated as a "favorite," two button presses are all it takes for Carnby to whip one up, provided you have all the necessary materials. 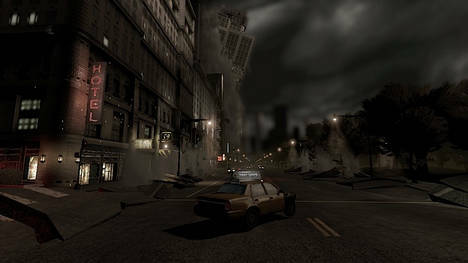 Vehicles have a considerable presence in the game, both for general travel and the occasional action sequence. I always worry a bit when a car gets thrown into a platforming/puzzle game but they are passable here. Cars are littered around Central Park and are really a necessity for covering the expansive map. Many of them have their keys still in the ignition, others might have a spare behind the sun visor, but you'll have to hotwire one from time to time. This is a pretty cool little bit of realism, as you choose the right wires to connect and press the accelerator at the right time to start the engine. Just like the inventory, it's all in real-time and a pursuing enemy may have the time they need to rip the door off its hinges and drag you out. If there were one feature that drew some confused expressions on the faces of gamers when announced, it would be the somewhat controversial level-skipping feature. The game is broken down into chapters and, with a DVD-style interface, you can hop from one point to another. There are advantages to using it, as you can move beyond the more boring middle section of the game and go back to something resembling fun. There's an early car chase scene which requires such precision that a single mistake will result in death that I seriously considered using it for. And, should you finish, you can hop right back to the last chapter and see the alternate ending without subjecting yourself to the whole experience a second time. Serious credit should be given to the sound design. So many survival horror games get it wrong by inserting music to heighten the tension in a scene but, in doing so, they warn the player that something "scary" is about to happen. Alone in the Dark largely avoids this trap, keeping the bits intended to frighten a surprise until they've happened. Alone in the Dark feels incomplete. The game is chock full of grand ideas but not a lot of polish. A few glitches present themselves when manipulating certain items in the environment or when driving through the park. When I played it, the animation of Carnby's jacket stopped working correctly in the late game, covering up my inventory so I couldn't see what I had without selecting it. They're annoying and really should have been fixed in a game that otherwise tries very hard to immerse you. It kills me that I can't encourage anybody to pay to own this because there really is a lot that you should like. The last hour of the game has some of the best puzzles I've seen in an action-platformer in some time which, if not particularly challenging, earn major points for creativity. Interacting with your inventory and the environment, seeing the results of your experimentation, is a joy. As a tech demo or proof of concept, it would be electrifying. Sadly, this isn't a demo. It's a completed retail product and one that disappoints on so many cylinders that it's impossible to overlook the issues for the merits. The game is boring for long stretches, has an uneven level of difficulty and no worthwhile story. Give it a rental and at least see what they've attempted because I'd warrant that some of the concepts presented will be finding their way into future games of the genre. Just make heavy use of that scene-skip feature so you don't wind up cursing my name.